Frontline Spray is a long-lasting flea and tick control treatment. It kills up to 100% of fleas and ticks on dogs and puppies within 24 hours. One application kills and prevents fleas for up to 12 weeks in dogs. It prevents heavy flea infestation and eliminates flea allergy dermatitis. The regular use of Frontline Spray is effective in treating brown dog ticks when applied monthly. It is safe to use on puppies from 2 days of age. Consult your vet prior to using this product in breeding, pregnant and lactating animals. 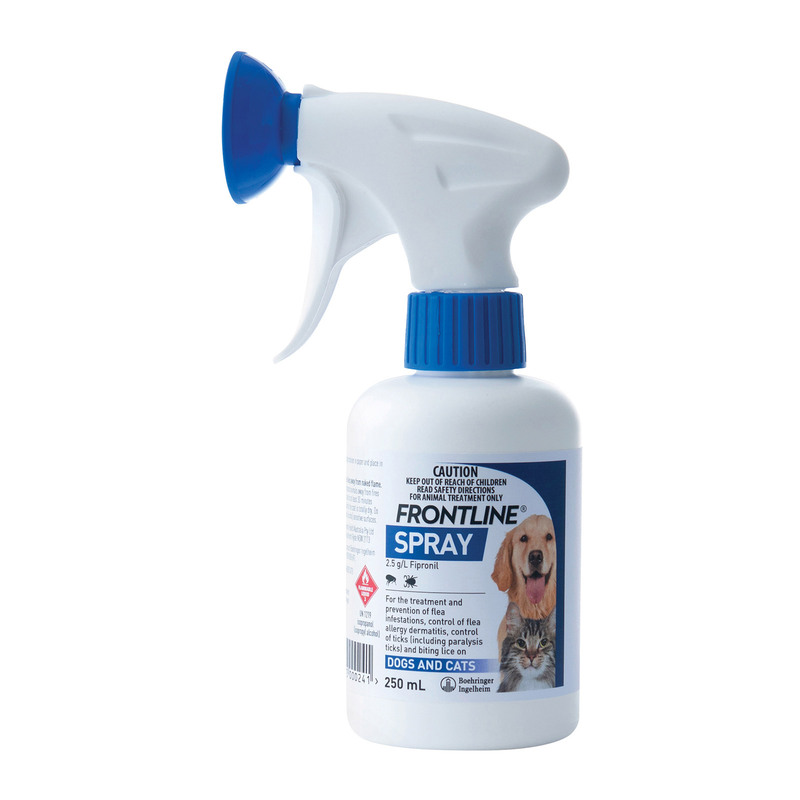 Frontline Spray contains active ingredient fipronil, which easily penetrates into dog skin. When fleas and ticks come in contact, the ingredient directly affects the pest’s nervous system. This causes paralysis and ultimately destroys the fleas and ticks. It also kills biting lice and protects dogs from Brown dog ticks. When applied as per label directions, Frontline Spray controls paralysis tick infestations for up to three weeks. It controls heavy flea infestation and prevents flea allergy dermatitis. Adjust the spray nozzle to the spray setting. Spray from distance of 10-20 cm. Spray the formulation against the lay of the hair. Ruffle the coat as you spray, especially the long haired or densely coated animals, so that the product penetrates down the coat. Allow the Frontline Spray to dry naturally. Do not towel dry your dog. When applied as per label directions, Frontline Spray controls paralysis tick infestations for up to three weeks. Ensure the coat is thoroughly wet especially on and around the face, ears and neck. Retreat at intervals of three weeks during the paralysis tick season. Following application, daily searching of pets for ticks is recommended to minimise the risk of tick paralysis. A new spray formulation for killing adult fleas and ticks. It controls fleas and ticks on dogs in heavily infested areas. Frontline Spray kills fleas and ticks before they lay eggs. The spray formula easily spreads on the skin. It controls and treats Flea Allergy Dermatitis in dogs. It is safe to use on puppies from 2 days of age. For paralysis tick control on dogs Frontline Spray must be applied every 3 weeks. Keep away from your eyes and avoid contact with skin. Store it away from heat and direct flame as the product is highly inflammable. Keep treated dogs away from heat and open flame until the application is dried. Consult a vet before using Frontline Spray on aged and debilitated dogs. Frontline Spray is not intended for pets hypersensitive to insecticides or to alcohol. The best thing about this product is I can use it on my small puppy. I have used this product a couple of times now. It definitely clears the infestation within few hours after spraying. I would certainly recommend this product to other pet parents as well. Frontline spray is a great formula that kills fleas and ticks before they lay eggs. It has been highly effective on my month old puppy. I have always used this product on my furbabies and would highly recommend it! love it and i feel they are very protected.